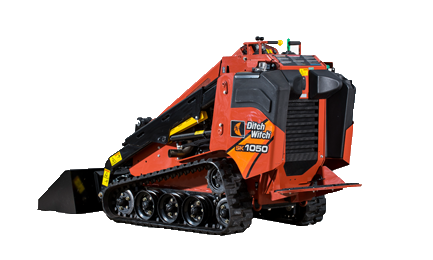 Ideally suited for a variety of demanding jobsites, the Ditch Witch SK1050 mini skid steer improves versatility and productivity by directing more hydraulic power to the attachment. 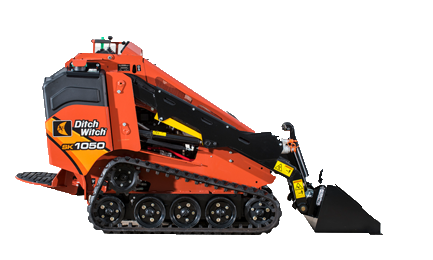 The durable, construction-grade design eases operator maintenance for improved Return on Investment, and outperforms all other working machines in its class. Designed specifically for the hardworking operator in mind, the best-in-class, spring-supported operator platform improves comfort for long hours on the job. 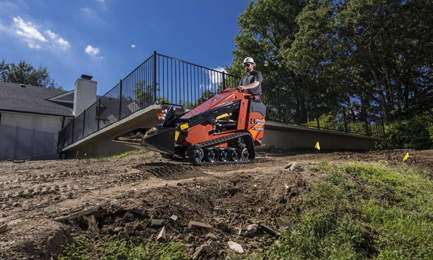 Equipped with a 37-hp Tier 4 Yanmar® diesel engine, the SK1050 directs 30 hp to the attachment, giving operators the power to tackle an assortment of challenging tasks. The SK1050’s attachment horsepower, combined with 13.9 gpm auxiliary flow and 3,625 psi (250 bar), results in quicker jobsite cycle times, making your crews more efficient. Standard auto-throttle reduces engine throttle when stepping off the platform for greater fuel efficiency. Best-in-class, 2.1 metre hinge-pin height enables more flexible and efficient loading and unloading at a wide range of dump heights and improved operating capacity ensures the machine can withstand maximum weight at maximum height. 482-kg rated operating capacity with exceptional stability allows operators to effectively maneuver jobsites while carrying heavier loads. At 3,625 psi, the SK1050 provides more hydraulic pressure to the attachment than comparable industry models, also leading to increased cycle times—saving time and money. . When enabled, standard auto-throttle reduces engine RPM after periods of sustained inactivity for better fuel economy. 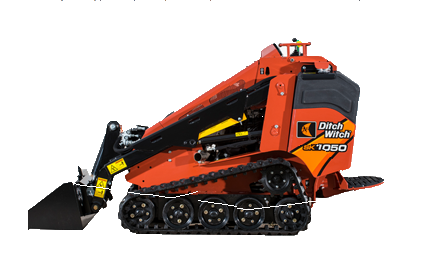 Built for heavy-duty operation, the robust design of the lift arms, rollers and undercarriage, improves overall machine longevity and ROI. 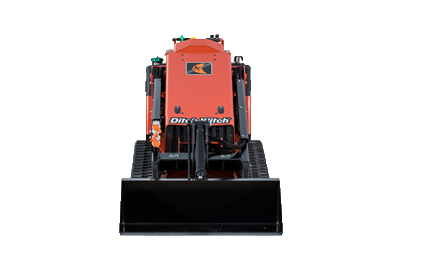 Easy access to the machine undercarriage helps keep the machine in proper worker order. With no daily maintenance points and no grease points, ease of maintenance is improved and total cost of ownership (TCO) reduced. Low-maintenance gauge track-tensioning system features a grease cylinder for easy adjustment and track removal, improving track life and reducing downtime. A standard hydraulic brake improves operator engagement and disengagement. 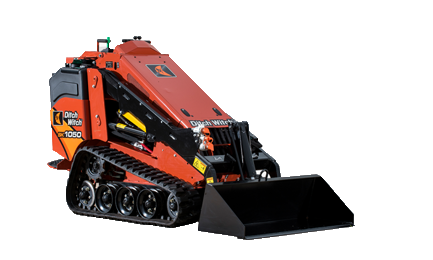 The SK1050 accepts many attachments to suit a variety of hardscape, landscape, utility, plumbing and irrigation jobs, making it one of the most versatile machines on the market. 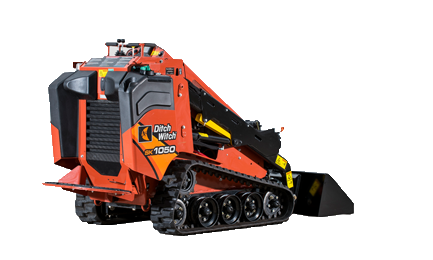 Designed specifically with the hardworking operator in mind, the SK1050 is equipped with a best-in-class, 188-cm2 operator platform for outstanding comfort and productivity during long hours on the job. Incorporating customer feedback, the machine features a repositioned muffler now on the side, allowing exhaust to escape without affecting operator comfort. An easy-to-use auxiliary-control foot pedal allows operators to maintain hydraulic flow to the attachment while freeing their hands to control depth and ground speed.